Pancakes have never been a favorite dish of mine. We had them once in awhile when I was growing up, usually while camping. I liked them fine, but they were never something I'd request. 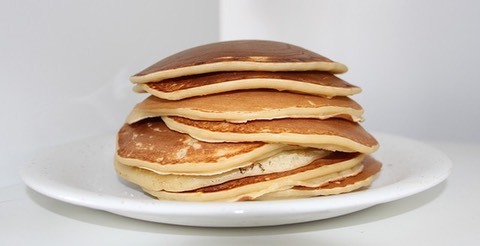 I've tried some fantastic pancakes in restaurants as an adult, but this was usually because my ex-wife often ordered them. They weren't something I'd order for myself. Several years ago, I bought a box of pancake mix on a whim and tried making them. Little had changed. They were fine but not worth the trouble. Roughly a year ago, I bought a cast iron pan, and loved it so much that I started looking for new ways to use it. This led me back to pancakes and to the surprise discovery that I liked them far more than I'd remembered. I began cooking them once or twice a week, eventually becoming frustrated with the limitations of the pan I'd bought (i.e., the size and the steep sides). I picked up a cast iron griddle. Even though I don't use it for much besides pancakes, I've been using it quite often. Had you told me just a couple years ago that I'd regularly be cooking pancakes, I wouldn't have believed you. Tastes change. That was the point to which the two previous paragraphs were leading. I started to like something about which I was previously kind of indifferent. My tastes changed. And of course, tastes are not the only thing that changes. Priorities also change. Something that might have seemed critically important several years ago can seem far less important today. I have been giving some thought recently to how Atheist Revolution does or does not fit with my tastes, interests, priorities, and the like. No, this is not one of those "I'm quitting" posts. I am not seriously considering ending this blog. I know I would miss it, and I do still enjoy many things about it. I am merely recognizing that I am no longer nearly as passionate about some of the things that led me to start it as I once was. I am also becoming more aware that there are things about how I have been approaching it (mostly with regard to my use of social media) that I do not particularly enjoy and could eliminate without too much downside. I've resisted making many of the changes I think I should make, and I'm going to try to get over this. My first step is going to be to critically evaluate all the social media platforms on which I have tried to maintain any sort of presence and eliminate those where the investment of time exceeds the benefits. I'm not planning to close any accounts just yet, but I am planning to stop using at least a few platforms. I need to look at the numbers before deciding anything, but I expect that I will stop investing time in Pinterest and Tumblr if the numbers confirm my suspicions. I also plan to stop using the Twitter account I have leftover from Mississippi Atheists. Collectively, this should free up some of my time. My second step is going to be to commit to taking more frequent planned breaks from blogging. I mention this periodically and never seem to follow through with it. The reason it will be different this time comes down to my changing priorities. Specifically, there are some things I'd like to do that writing posts for Atheist Revolution is interfering with and that have become more important to me. That means I am going to take a week or two off every now and then to accomplish some of what I'd like to accomplish. Third and closely related to what I just said about taking more frequent breaks, I plan to spread out my posting a bit more. I've been doing this for awhile already (i.e., not attempting to post every day), and I've come to terms with it for the most part. As much as I like the idea of daily posting, it just isn't realistic for me at this time. I'd like to be a bit more intentional in how I spread things out, but we'll see. Some of it may just have to continue to be driven by what else is going on. I'm sure other things will occur to me, but that's it for now. I am still interested in maintaining Atheist Revolution, but I am less willing to do so at the cost of other things I'd like to do. And that means that it will probably function a bit differently moving forward than it has in the past. I just need to learn to be okay with that.